The wave of refugees from eastern Ghouta, an area with hundreds of thousands of civilians, is the latest in a war that has displaced millions of people, and the office of the United Nations High Commissioner for Refugees on Tuesday voiced alarm at the surging numbers of casualties and people driven from their homes. Tens of thousands of civilians remain trapped in eastern Ghouta, and relief agencies are just beginning to grasp the full extent of humanitarian needs in an area where years of siege have created desperate levels of malnutrition among children and shortages of medicines. “Only a monster targets civilians and then ensures that there are no ambulances to transfer the wounded, no hospitals to save their lives, no doctors or medicine to ease their pain,” Nikki R. Haley, the American ambassador to the United Nations, said on Monday. In a statement released on Tuesday, Mohammad Javad Zarif, Iran’s foreign minister, called the American position hypocritical, noting that the United States supported Iraq in the 1980s, when it used chemical weapons against its own population and against Iran. Mr. Trump’s “threats to repeat impulsive acts of aggression is symptomatic of U.S. policy helping extremists,” Mr. Zarif said. Relief agencies are struggling to cope with the needs of those fleeing eastern Ghouta, including more than 45,000 now packed into eight shelters around the outskirts of Damascus, where the crowded conditions and lack of sanitation pose a threat to health. Andrej Mahecic, a spokesman for the United Nations refugee agency, told reporters on Tuesday that it was shipping in tents and supplying a range of other basic supplies, but that many people had fled eastern Ghouta with nothing but the clothes they were wearing. He said the agency was buying garments from local suppliers. Relief agencies are grappling with similar pressures in the north of Syria, assisting more than 137,000 people who fled the city of Afrin in recent weeks as Turkish troops mounted an offensive to drive out the Kurdish forces controlling it. Although some of those who fled are drifting back to Afrin, Mr. Mahecic said many were living in makeshift shelters and unfinished buildings. Dozens of rebel fighters and their families have been bused from Douma to the northern province of Idlib in recent days, under a deal brokered by Russia that is expected to give the Assad government complete control over eastern Ghouta. The United Nations secretary general, António Guterres, on a visit to China, expressed outrage on Tuesday about the reported use of chemical weapons in Syria, and he urged Security Council members to agree on a mechanism to investigate such attacks. He also called for immediate access to the site of the attack by investigators from the O.P.C.W. United Nations relief agencies said they could not comment on possible chemical weapons use in Douma. The area remained sealed off by government forces and their allies, and they had not received any samples for analysis, officials in Geneva said. 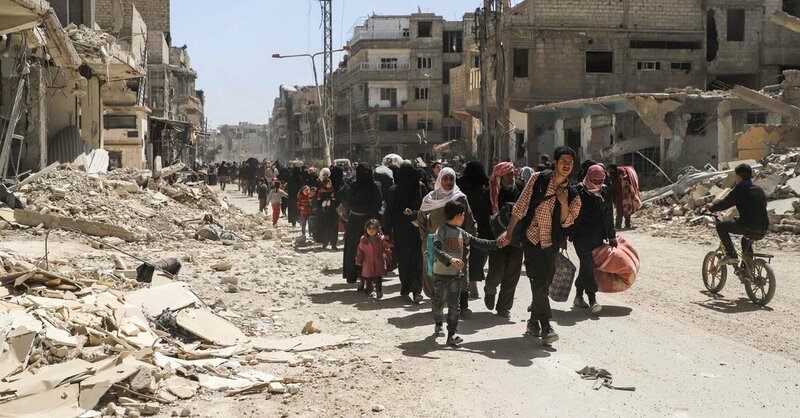 133000, Besieged, eastern, flee, Ghouta, says, Syrian, towns, U.N.